There have been many years throughout American labor history that have changed the ways that the affected communities live. Many movements have shifted styles of working, changed the nature of the working-class life, and have brought about such things as unions that we still possess today. In particular there are three major eras that have brought about such changes and one that is of the most importance. The progressive era brought us many changes in the workforce along with changes in technology. Also the roaring twenties was a period that started with great wealth extravagance and ended in the great depression that changed the entire country. Then there was the 1930’s where FDR proposed the New Deal and had great ideas of where to take the country. Each of these eras created significant differences in the way the people worked and lived and will be further discussed in detail. The progressive era began in the late 1890’s with a depression that led to one of the greatest movements of the era, the Pullman strike. The Pullman strike was started because of the depression and because of the fact that George Pullman, the man who owned Pullman Palace Car Company, fired a third of his employees and then cut the wages of the rest by 25 to 40%. The worked were left with hardly anything to bring home and they met to organize this strike. 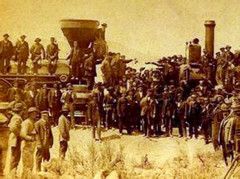 It became a national strike because nearly every railroad had Pullmans and there was no other way to transport the goods across country. The strike eventually became so large that it was halted by the government and ultimately ended in great violence. However, the Pullman strike was a success; it created organization amongst workers and gave workers a voice for the first time. Another large movement during this era was the influx of new immigrants and the emergence of nativism. Segregation was still a large part of the American life however now immigrants began moving to the country and they faced a greater prejudice than had all other earlier groups. An anti-immigration sentiment swept the nation and led to what is called nativism. Nativists believed that the immigrants caused corruption, kept wages low, and blamed them for political turmoil and were even discriminated for living in poverty and having peasant habits. This led to the first restriction on immigration in which paupers and convicts were denied entrance to the country. Also any person who was believed to have a contagious disease was also denied entrance. Nativism was an important factor because immigration was alive and real and the American population was divided on how to deal with it. Employers were happy because immigrants provide cheap labor but on the other hand American workers felt their jobs were being taken and that it was causing a detriment to society. A third labor issue of this era was a positive one when the idea of scientific management was adopted and brought about Taylorism. Maximum efficiency was the idea in mind when this idea was adopted and in which Taylor analyzed his workers, broke down jobs into steps and then timed his workers. This led to mass production and broke the jobs down into steps, such as assembly lines. This created many new jobs for both skilled and unskilled workers. It became a very efficient and effective means of producing goods and not only increased employers control over the workforce, but also increased their production and profits. The Roaring Twenties is an era in which people think of great prosperity and extravagance however it was a period where unemployment rose quietly and led to great hardships amongst the country. The single most important product in the 1920’s was the automobile and during this era manufacturers tripled the production of cars and by 1929 almost half of the families in the U.S. owned a car. It was a huge movement in the country because it changed the way workers spent their leisure time creating means of travel, and also employed a significant amount of the nation’s employees. It held the hand of many other complementors such as the steel and tire industry and allowed them to prosper through as well. The mass production of automobiles clearly changed the way people lived during this era. Women as workers and consumers also became a large part of this era. More women were taking jobs outside of the home and replacing children as second wage earners in the family. They did not gain equal rights as the men in the workforce however they were allowed to earn wages and they became a large part of the consumer force as well. It led to their economic independence and further strengthened the suffragist movement. The greatest economic detriment during this era, and maybe throughout history, was the stock market crash of 1929 and the great depression that followed. As many as one of three workers were jobless and on the streets, factories and banks were all being shut down and farms were being foreclosed. This lasted for a full decade and struck both domestically and internationally. It was clearly the most difficult period the American workers have ever had to face. During the aftermath of the stock market crash, Franklin Delano Roosevelt was elected to presidency and promised the American people a “new deal”. During this period the economy dipped to its lowest point and he was forced to do something about it. The New Deal introduced types of social and economic reform and represented the peak of a trend toward abandonment of “laissez-faire” capitalism. The administration adopted a policy of moderate currency inflation to start an upward movement in commodity prices and to afford some relief to debtors. They also continually worked on balancing the budget quickly. The New Deal years were characterized by a belief that greater regulation would solve many of the country’s problems and it was one of the most important movements in the country. It brought about many new organizations and acts such as the CCC for the young unemployed men of the country and the AAA that provided relief to many farmers and the NRA which set codes for fair competition. The New Deal became subject to much criticism from every political side however, it help pull the country out of a great depression and installed confidence amongst the country. It revived the working class and labor unions and started many new organizations and although it didn’t completely end the depression it did make a means to a new beginning.